The late Anatoli Bourkreev coined the phrase “touch grass before the summit” meaning that he descended from EBC to the nearest village that had grass in the area, say Tengboche, before returning for his summit bid. He felt it helped his body recover from weeks at extreme altitude and gave him a rest. Well today, our climbers are leaving any grass for the tundra of the high Himalaya. But first the latest headlines. 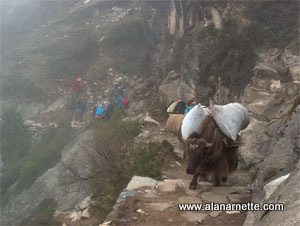 Several teams are reporting they trekked in the rain around Namche that made the dirt trails very slippery. Snow was also reported higher up on Sunday, April 7, 2019. I took this #selfie 12 years ago when I stood on top of #everest for the first time. The following year in 2008, I went back to the top for a second time on my first #cleaning expedition and to spread the word about the harm #climatechange was doing to our #mountains. Since then, I’ve been lucky to climb many more #mountains and clean over 19,500kgs on Everest with my awesome #Sherpa team. This year, in 5 days time, I head back up to Everest to attempt a 3rd summit and if all goes well, cross a total collection of 20 tonnes of garbage. Over on Annapurna, the fixed line is now to Camp 3. I used to note the best blogs each day with “Blog of the Day” citation in my own coverage but with the advent of social media most people post short snippets and don’t go into detail on their experiences. I’m thrilled that this season there seems to be at least one exception and thus far I’m thoroughly enjoying her writings. I’ve mentioned her before as a “climber to watch” because Kirstie Ennis is a former marine who lost her leg in Afghanistan after her helicopter went down. The accident broke her left ankle and caused severe damage to her leg, tore her rotator cuff and labrum, injured the cervical discs of her spine, shattered her jaw, and caused severe facial lacerations, a traumatic brain injury and posttraumatic stress disorder. She has had over 30 operations. I decided to try and meditate. Which really just turned in to me wondering how the Hell small Nepalese people could make so much noise above me. I swear they were dropping bowling balls in an effort to sweep the floors. She is a must-read all season! Now on to what they are experiencing on the trek. After your “active rest day” at 4,420-meters/14,500-feet in the village of Dingboche, its time to move even higher. Now the altitude is getting serious. The routine is familiar and even routine. Wake up as the sun rises, throw more layers on top of the layers you slept in. Comb your hair or just put the skull cap on tighter. Wash your face, brush your feet. Re-pack your sleeping bag for the 785th time this trip and haul your bag into the hall for the porter to carry. Stuff a few things in your day pack, which has gotten amazingly small as your duffle bag has grown amazingly large since you left Kathmandu. You go to breakfast. All of this takes 17 minutes – you timed it. The terrain is very different than the land of rhododendrons and magnolia trees. This alpine land is fragile yet an obvious trail marks the route based on hundreds of thousands if not millions of footsteps. It takes a moment to destroy it and a decade or century to grow back in this environment. It seems that every turn brings another astonishing view, and you thought Ama Dablam was perfect, it just gets better and better. You have become accustomed to the yak trains that seem to be everywhere now. Even though they are familiar, you always stop and take their picture – they don’t seem to mind! And their clanging bells are now a source of comfort. The route goes downhill and follows a stream until the stream becomes a river with large rocks on both banks. A makeshift bridge is in place as it seems all the previous models have washed away. You gingerly cross the bridge and follow the dirt path to the single lodge that defines the village of Dughla. Stopping for lunch, all you see is what appears to be a long steep dirt hill between you and the next teahouse, and you are right. Hmm, when will you stop being surprised that a trek in the Himalaya has more ups than downs, at least when you are going up! You down the fried rice you ordered for lunch along with your Orange Fanta (not diet), something you would never eat and drink at home but burning 6,000 calories a day has its benefits! Pack on your back and up the hill following the other climbers, trekkers, yaks and Dzos on their journey. Topping the hill, the mood changes. All you see are memorials. Even though Lobuche is not far away, you stop. You take off your pack and pull your jacket tighter around your neck. The wind has picked up at Dugla Pass. It does not matter. A long ridge holds fifty or more chortens, or rock memorials. Each one has a name carved in the stone or perhaps a more elegant brass plaque. The vast majority are for Sherpas who have died helping westerners achieve their goals. You stop at each one. How did they die? Weather, health, accident? It did not matter. There were climbers from many countries: Belarus, Japan, Austria, Canada, Nepal. Most were Sherpa. Most were young. Climbers following their passion. Chasing their dream. Doing a job. It did not matter. Most of the names have been eroded away leaving you to only see the remains of name or a date. Some were famous – Scott Fischer, Babu Chiri. Most were not familiar. Names long since forgotten by the climbing community. Names remembered daily by their families. The setting was perfect – above the treeline – on the alpine tundra – views of mountains. They would have liked it. Leaving the area, you walk a bit slower thinking about the team and Sherpas who will be there. Your purpose, your home, the task ahead. It is now clearer than ever that climbing Everest is deadly serious. You glance at your Sherpas with respect and appreciation, understanding that, for most, this is their job for your dream. Thank you for an amazing blog! I went trekking to EBC last year this time, and the memories are exploding in my head while i’m following your coverage. Hope for the best conditions for our climbers! That map would be useful with distances between the villages.